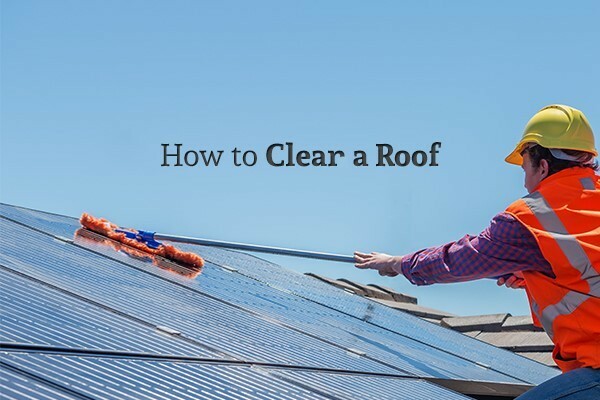 When was the last time you cleared the debris from your roof? Many homeowners are unaware of the importance of this basic home maintenance task. Over time, debris can accumulate on your roof and in your gutters that can become unsightly or even lead to permanent (and costly) roof damage. A leaf blower is often the most effective tool for removing debris from the roof itself, but it’s important to take proper precautions when doing so. Here is how to safely remove debris from your roof. If you plan on clearing debris from your own roof, safety must be your top priority. Working on a roof comes with many inherent dangers—the risk of falling being the most serious. You should wear slip resistant shoes and have someone hold the ladder to help make sure that you don’t fall and injure yourself. Another thing to keep in mind is that you’ll want to avoid stepping on the roof in order to avoid damaging your shingles. Ideally, you’ll want to pick a day where the weather is relatively cool and overcast. Furthermore, make sure that there’s no chance of rain on that day. Now it’s time to start clearing the debris. A leaf blower is the best tool for completing this task because it can reach the parts of the roof that you can’t reach yourself from the ladder. Be careful not to point the leaf blower directly at the shingles to avoid damaging them. It’s also important to avoid blowing the debris towards your chimney, skylight (if you have one), or any other potentially vulnerable part of or opening on your roof. As part of your roof cleaning routine, you should take the time to clean your gutters as well. After all, many roof problems (including algae growth) are often caused or made worse by clogged or dirty gutters. Your gutters are an important part of your home’s roofing system, so don’t neglect them. If you’re not comfortable cleaning your home’s gutters yourself, you can always call a roofing professional to handle this for you. Ideally, you should have your gutters cleaned at least twice a year. There are steps you can take to prevent algae growth and other roof staining problems. For starters, there are products you can buy at your local home improvement or hardware store that are specifically designed to help protect your roof from staining and discoloration. Another solution specifically for algae prevention is to install copper or other metallic strips along the edges of your roof, since the ions from these metals kill algae on contact. These strips are relatively inexpensive and easy to install, so this may be a worthwhile option if your home’s roof is prone to algae growth. In reality, the only way to guarantee that your roof doesn’t get damaged while it’s being cleaned is to call in a roofing professional. To get your roof properly maintenanced, contact Acme Roof Systems Inc. Their roofing experts will help make sure that your roof stays in great condition for years to come.